I love the symbolism of the new bud and the old tendril. A changing of the guard! I found the tendrils as interesting as the buds were beautiful. I had no idea they would hang around through the winter, essentially undamaged. It’s hard to see their curls amid all the leaves in summer, but this was the perfect time to admire them. Grape vines are such tenacious souls! That is a beautiful photo of bud break, Linda. I thought about you and your vines when I was putting this together. I learned a good bit about vineyards in the process, and it all was so interesting. There’s a wine-maker across Galveston Bay that I’ve written about. I ought to head over there and see how things are progressing with his vines. It’s a beautiful process, and I was pleased to get some good photos despite the wind that was howling that day. Beautiful macro, Linda. Muscadine, I think, are the wild grapes that take over many a bird sanctuary. I do hope you’re visually enjoying all the spring growth and wayward birdies like I am! Thanks, Shannon. It is a beautiful time of year, although I have the feeling that things are moving too quickly — by the time I get out and about again, I fear many of the early spring flowers will be gone. No matter. Something will be there to take their place, and I’ve seen so many flowers for the first time this year I just can’t complain. This is exquiste, Linda. Beautifully captured and expressed. Thank you, Pete. There are so many delights in spring, it’s hard to know which direction to look. I was pleased to find this vine conveniently draped along a fence. Do wild grapes taste any different? They tend to be more sour, and in my experience their skins are thicker. I’ve read that wild grape leaves taste like grapes. A little further into the season, I’ll check that out! Plants are masters of packaging. It never fails to amaze me how the leaves unwad from the buds so effortlessly and perfectly. Those NASA engineers who have to figure out how to get all those space probes into space and then have them unfurl mirrors or antennas could get some good ideas there. And that packaging is a marvel at both ends of a plant’s life: in the buds, or in seed pods, like milkweed. “With increase of air temperature in spring, tiny bodies of leaves and flowers come out of their buds and start to grow. In their buds, therefore, various ideas to stow their bodies are often observed. For example, the leaves of common beech have a typical corrugated folding… the fan-type bellows pattern is observed in maple leaves…the petals of a morning glory flower are rolled spirally in a spindle-shaped bud… and other deployable structures in plants are also shown by Delarue and Kresling. Let’s hear it for the scientists — and your creative thinking! I love that term — bud break. It really does say it all — and you’re right. It is great and beautiful. I’ve had the feeling a lot of you were about ready to burst yourselves, just waiting for spring. I like the way the tendril, bud, and branch form a bit of an “X” — marking the spot where spring can be found, perhaps. Thanks for the term bud break. The thing itself, especially on mustang grape vines, has fascinated me for the years I’ve been doing native plant photography in Austin. Isn’t that a great term? It’s a beautiful process, and one I’ve not seen. Usually, by the time I start paying attention, the grapes have good-sized leaves, and are getting ready to set fruit. You might be interested in the link I left in my comment to WOL, above. Some Japanese researchers have studied unfolding buds as models for deploying various pieces of equipment in space. The full article includes the math associated with their work. I looked at the article and noticed how complicated the math gets. That corresponds to the intricacy of the mechanisms that plants have evolved to package and unfold their new parts. It’s impressive. Actually, I have some readers in places like Iowa who wouldn’t be amused by that, Curt. The forecast for parts of South Dakota, Nebraska, and Iowa includes the word “blizzard,” and suggests 6″-8″, 45 mph winds, and whiteout conditions. Hello Spring, indeed! I was looking at the weather this morning, Linda. It looks downright nasty for the midwest, and Texas too. It snowed here two days ago. But at least we are alternating, playing early March in mid-April. Let’s go where the birdies is! I’m so glad to hear that you’re seeing some of this process too, Val. It’s sounded fairly grim in your part of the world. It’s time for some buds to break, and some flowers to bloom. I certainly was delighted to find these little buds, and I’m glad you like them. It’s okay here, just the usual British weather… things are a bit late, though, so only some of the buds are showing. Our May tree (Hawthorn) has barely any leaves yet and as you can probably tell from the name, it’s usually in full flower by May. I wonder if your hawthorn is the same as our mayhaw tree. Ours is a hawthorn, and blooms in May — hence, the name. It’s uncommon where I am, but I think it’s pretty common in east Texas. Every now and then I find someone selling mayhaw jelly, and it certainly is good. Mmm, no, different. https://www.woodlandtrust.org.uk/visiting-woods/trees-woods-and-wildlife/british-trees/native-trees/hawthorn/ I don’t think ours is edible… Also, ours is incredibly thorny! But, my goodness — isn’t it beautiful? Truly beautiful photo of the budding grape. I especially like this part of spring when new buds are forming. The new growth looks so delicate and it is hard to believe that delicacy turns into strength and the formation of food, for animals and man. Wild grape jelly is just too good and I have made my share of it in my younger years. There’s so much good food around: not only the grapes, but plums, cherries, dewberries, yaupon, and beautyberry. On this same trip, I finally found agarita blooming. Usually I miss the berries, but now that I know the bloom is on, I’m going to try and get back to the spot where we found such thickets of them and collect enough for jelly. My friend, who knows how to do such things, prefers the sheet-and-broomstick method. She puts the sheets on the ground, and then wallops the bushes with the broomstick. It makes sense, of course, since picking agarita berries barehanded would make as much sense as gathering prickly pear tunas the same way. Do you know Merriwether’s Foraging Texas? I’d never take it as far as he has, but it’s fun to browse his site. There’s a lot to learn there. He does a lot of workshops and walks, too, and travels all over the state. He might even end up in your area. Thank you, Linda for the book tip. I have not seen it but it surely sounds interesting. I have wanted to find some Agarita bushes but they are few and far in between in my genral area.I have always wanted to plant some but I think I would need to go the Natural Gardner in Austin and perhaps they have some to sell. I have called them in the past abut the hops tree and the nursery has the trees for sale but I did not follow up. I regret that now but too much was happening in my life at the time and honestly to much is still going on. Dewberries are delicious aren’t they? My mother made delectable cobblers when I was growing up. Truth to tell, I prefer cobblers to pie most of the time: at least, when fruit fillings are involved. I just made a peach cobbler on Easter, with peaches I picked and froze myself last summer. It’s time to use the rest of them, because we’re getting nearer the season for fresh ones. I wasn’t sure agarita would grow in your area, but the USDA map shows it there. You’re on the very eastern fringe of what the map shows. I was surprised when I found the flowers. For some reason, I’d assume they would be white, not yellow. They are pretty little things — and well defended by those leaves. I too love cobblers, which are juicer than pie. The agarita I’ve seen growing not far from my house but it is on the side of a busy road growing, in rocky cliché soil, not far from the lake. It also grows near my son’s house but in the roadside ditches. It grows in parts of western McLennan were ever there is rocky cliché soil. The western part of my town is actually considered the far reaches of the hill country. There are isolated pockets of the hill country which is interesting. The Balcones fault line is under a part of my property and I have the cliché soil in many areas of my yard. My neighborhood has many live oaks. I hope to go the Natural Gardner in Austin next year and get some agarita and also the hops tree. It sounds like you’re in the perfect spot for some of those wonderful natives. I didn’t realize that agarita’s so attractive to pollinators, too. The ones I found were covered with bees and ants, and I’m sure there were some flies around, too. The various regions of Texas are so interesting. I’ve finally figured out that even though I divide my time a bit between the coast and the area around Kerr, Gillespie, Bandera, and Medina counties, there’s that whole “hill country area” around Austin that I know nothing about — and that has wonderful flowers. So many places, so little time! The old with the new, the end with the beginning! And around and around we go, season to season. As Jimmy Buffett put it so neatly, “every stop there’s a place to start. I thought of you the other day when I bumped into this article about pesticides and solitary, cavity-nesting bees. It’s an interesting read. How exciting! I get to enjoy the beauty of your spring while ours is still a ways off! I’d never heard the term “bud break” before, but it’s very descriptive. I’m becoming more familiar with wine-growers’ terms now that Texas is developing more vineyards, and I’m paying more attention., too. I’d never heard of bud break until last year, and this is the first time I’ve seen it. Wild grapes along a pasture fence are just as pretty as any in a vineyard — even if they are a little unruly. Did those nasty, blizzardy conditions come far enough south to get you in the past days? It seems to me that winter really ought to be over. I can only imagine how eager you are for it to get out of the neighborhood — Dallas, too, I suspect. I didn’t realize until I read a bit about grapes that the tendrils emerge opposite the leaves — and not every leaf. It apparently depends on the species. For example, on some vines there will be a tendril every third leaf. The complexity’s just stunning — but what fun to get a glimpse of it. It’s fascinating! 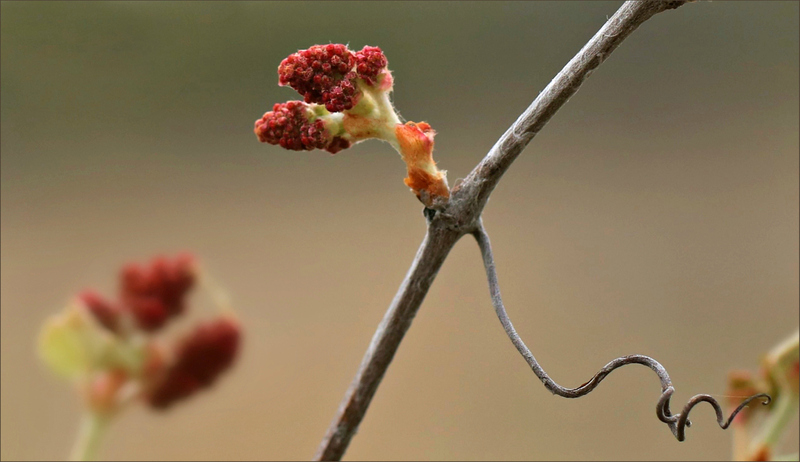 It’s interesting how ‘bud break’ is used exclusively with grapevines, except when it’s written as ‘budbreak’, where it just means the ‘initiation of growth from a bud’. I also just realized the Virginia Creeper here is from the grape family also, which is Vitaceae. The plant I saw is just beginning to flower now.